SPORTS GALAXY BY M.S DHONI offers a daily training programme to aspiring athletes to join us on a batch basis. This program will kick off with cricket and will be followed up by other games (football, skating, archery etc) that are being offered by us. This program is designed for athletes living in the city and can too and fro from their homes regularly. The daily program will focus on developing the players fitness and agility through drills and schedules deignes specifically to improve speed, strength and overall gameplay of the players hence the daily program is perfect for those who require to train everyday in a sports environment and through apex level of professional coaching. 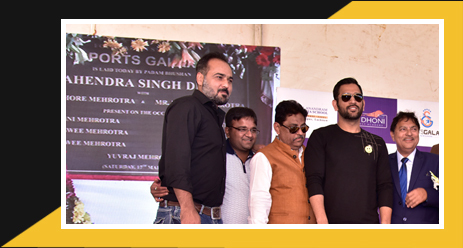 SPORTS GALAXY BY M.S DHONI will develop a customized curriculum to meet every individuals goals and on the other hand they will be studying in SETH ANANDRAM JAIPURIA SCHOOL ALAMBAGH CAMPUS, one of the best school in the city, within the campus of SPORTS GALAXY BY M.S DHONI which will help the students to groom their academic front. SET UP DRILL (STANCE / GRIP / BAT BACK LIFT) FOR BATSMAN. RUNNING TECHNIQUE / BUILDING ACTION FOR PACE BOWLERS. RUN UP / BUILDING ACTION / SPIN DRILLS FOR SPINNERS. WICKET KEEPING DRILL FOR WICKET KEEPERS. DIFFERENT FIELDING DRILLS FOR FIELDERS. ONE TO ONE SESSIONS (OPTIONAL). 6 SESSIONS A WEEK (MORNING / EVENING) , DEPENDING UPON THE INDIVIDUAL CAPACITY, MONDAY REST DAY. LOAD WILL BE MONITORED FOR EACH INDIVIDUAL & IF NECESSARY A CRICKETER MAY BE RESTED FOR 2 TO 3 SESSIONS PER WEEK. 6 SESSIONS A WEEK (MORNING / EVENING), DEPENDING UPON THE INDIVIDUAL CAPACITY, MONDAY REST DAY. Trials form to be filled on site or online. All those who filled the forms will be called for the Trials on age group basis. Trials will be supervised by the coach deicided by M.S DHONI. 50 best performing players in each age group will be selected by the coaches who will be eligible for enrollment. Enrollment forms to be filled online or at campus.